Brand new Ostrich Emotion crane machines are currently on sale. Please contact our sales staff for pricing and order information. 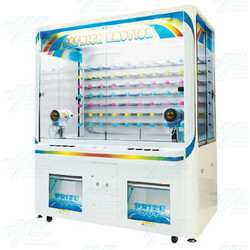 The machine features dozens of protruding bars that allow operators to stock the machine with various sized prizes and gifts. The bars are are movable in order to accommodate different shapes and sizes.